Thread: ID Help *pics incl. Ok... So when we bought this nice little frag we were told it was "South African sea sponge"
I was trying to do some research on it, as it looks like it isn't doing it's best ! Surprise!! I can't find anything of the sort or similar. So Our little guy isnt getting what he needs and i don't know what that is ? Do any of you have this? Do you know what its realy called? What does it need to be doing better? Sry I guess the post didn't make it into the last thread? Side note: We do have other forms of what i believe to be Sponge of some sort check it out let me know what you think ! On our polyp rock there seems to be 2 sorts of "sponge". One looks purple and cocoon ish and the other is more "solid" or "harder" looking if you wish. Both definately are sponges, but no idea on the type. The problem with sponges is they are very sensitive to air and the decorative sponges usually die off in captivity because of this. 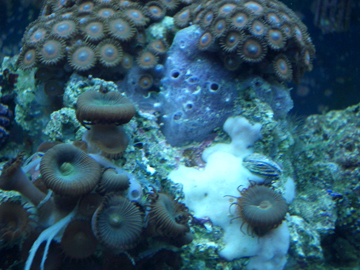 Most frags, corals have no problem with being pulled from a tank and exposed to air for a short period, however this is deadly for sponges and they will usually die as a result. 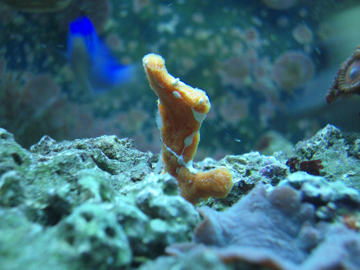 There are some sponge materials that grow well in aquariums but are usually in low light areas behind rocks. Most commonly is a white sponge. 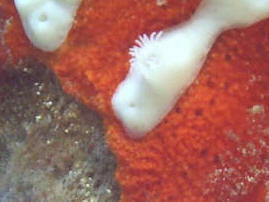 The first and second pic looks like some type of zoanthid... 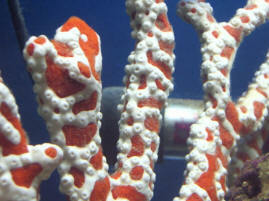 I remmeber reading about this type of coral... some say its a zoo that lives on a sponge. I'll find a better pic and info and post it for you. Any one have this kinda sponge? Any advice on keeping him happy ? 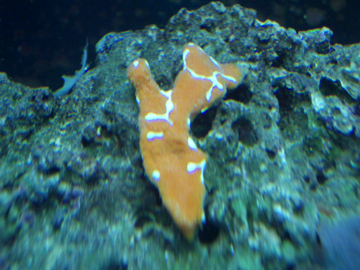 I had a frag of one but it never made it... I heard people using reefroids with success. This is not a gorg, but is in fact a sponge with a type of zoa growing on it... i forget its name, but if it comes to me i'll reply again.